Malta’s political system seems to rest on two main pillars; the apparatus of State and the power struggle between the two main parties to control this system. In some respects, this structure is similar to that of other democracies. However, the uninitiated observer will soon become aware that partisanship in Malta permeates through every aspect of society. Some express concern at the high levels of partisanship and the antagonistic attitude adopted by the party faithful. Few are willing to change this culture. Moreover, as an election approaches, the same people who criticise the party system will revert to type and parrot the party line. 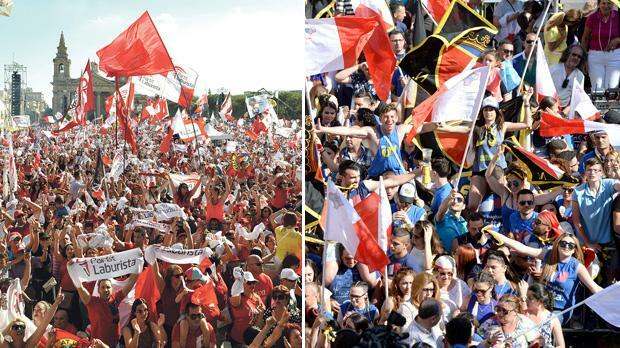 The presence of two parties competing for power leads us to believe that Malta is not a one-party State. While parties may offer differing visions, these visions rest on the same premise – that there is no alternative to the confrontational two-party system with the current level of ‘bread and circuses’ gutter politics. The absolutist role that parties play is best summed up in the now ubiquitous phrase that “no one is greater than the party”. This attitude is the scourge of independent thought and the graveyard of political ideas. It rests on absolute loyalty to party leaders and party structures regardless of whether such blind loyalty is deserved or beneficial to the common good. This does not suggest that political parties are redundant. Within a parliamentary democracy, they are necessary to usher legis­lative change in the House of Repre­sentatives. However, we must question whether this slavish attitude to political parties is of any benefit to society as a whole. The glorification of political parties is remi­niscent of the politics of the former Soviet bloc. The party took precedence over the State; absolute loyalty was due to the leader and the most powerful position in the coun­try was the equivalent of the party leader rather than the Head of State. Communism created a nightmarish reality – a secular theocracy where the party set the norms and the dogmas of the day. There were some benefits to this system. It provided security. Once one accepted the narrated version of events, one had clarity, meaning and an answer to all questions and anxieties. These arguments are addressed in Vaclav Havel’s brilliant essay on The Power of the Powerless. There is a price to pay for this security. One abdicates “reason, conscience, and respon­sibility, for an essential aspect of this ideology is the consignment of reason and conscience to a higher authority”. The centre of power becomes the “centre of truth”. Havel uses the example of a greengrocer who places a poster with a slogan on his shop window. The owner has no particular enthu­siasm for the slogan. He displays the banner because it’s what everyone does. It keeps him out of trouble; it avoids having him described as being ‘disloyal’, and it allows him to get on in life. Such a system, described by Havel as a “post-totalitarian system”, demands “confor­mity, uniformity and discipline”. The greengrocer would never admit to his fear of not conforming to convention, but the very act of displaying the poster betrays his submissiveness. Fear dominates because the system regards overstepping predetermined roles “as an attack upon itself”. The system thus functions on hypocrisy and lies. Such a system can only exist because peo­ple can be compelled to live in this manner. Nonetheless, within every human person, there is a “longing for humanity’s rightful dignity, for moral integrity, for free expres­sion of being and a sense of transcendence over the world of existence”. Havel takes his greengrocer metaphor to another level. One day, he refuses to put the slogan up and to go with the flow. He says what he thinks, expresses solidarity with others, and breaks the rules of the game. This comes at a price. His position at work is threatened, his family’s future may be in jeopardy, and everyone around him looks at him suspiciously. However, he has acted with integrity. How can one break this circle of lies? Firstly, we must begin to seriously question whether we want to continue living within such a system; whether we’re comfortable with living with a public life which has been so contorted and corrupted by partisanship. Then, we must look beyond the current structures for a genuinely independent public life. Havel is dismissive of the word “dissi­dents”. He is right; many “dissidents” do not set out to dissent, but seek to express them­selves in a manner which may not neces­sarily conform to accepted attitudes. They may be writers, philosophers, histor­ians, sociologists, musicians, priests, artists and singers who may find no avenue on the official, or semi-official, channels. There might be several points of dis­agree­­ment with Havel’s arguments. How­­ever, 40 years removed from the publication of this essay, his rallying call to “focus politics on real people” is more pertinent than ever. As citizens, we are also engaged in this political struggle. Why do most of us insist on perpetuating this system? André DeBattista is an independent researcher in politics and international relations.